Headed out towards the Wilmington Canton today on the Reelality. Seas were flat and the Full Moon made it bright as day running out. We got lines in the water at 6:30 with chick birds picking in 66.7 degree green water. 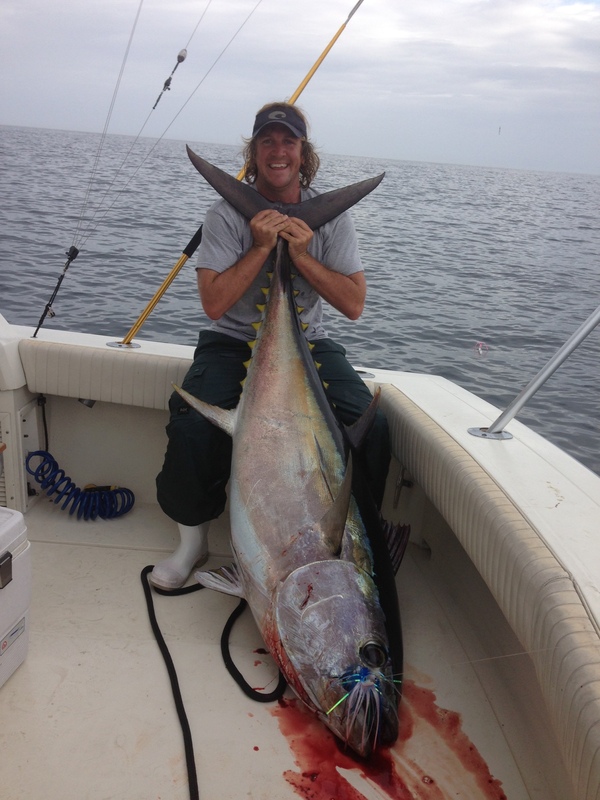 After 15 minutes we were hooked into a double header of bigeye tuna! After almost spooling a 50W reel, Duane started to gain on his fish and the hook pulled – heartbreaker. I was still into mine and we got it close after about an hour, it was holding tight about 25 feet then decided to sound. Finally after an hour and 35 minutes on the fish, and solid boat handling by Keith, Duane and Stephen sunk the gaff into a solid 70″ bigeye which is my first personal bigeye! I was ecstatic to say the least. It ended up weighing in at 199.5 lbs. 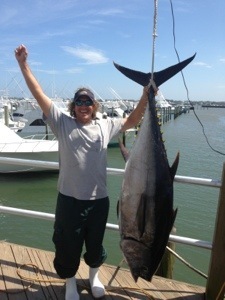 We got back on the troll and caught about 15 yellowfin tuna. We didn’t find the yellowfin tuna until we crossed the break into 70 degree water a few miles south of where we started. Only 5 yellowfin ended up being keepers, but we had more than enough meat so we picked up and headed back to Cape May, NJ at noon to beat the forecasted blow out of the SW. Awesome day of fishing!